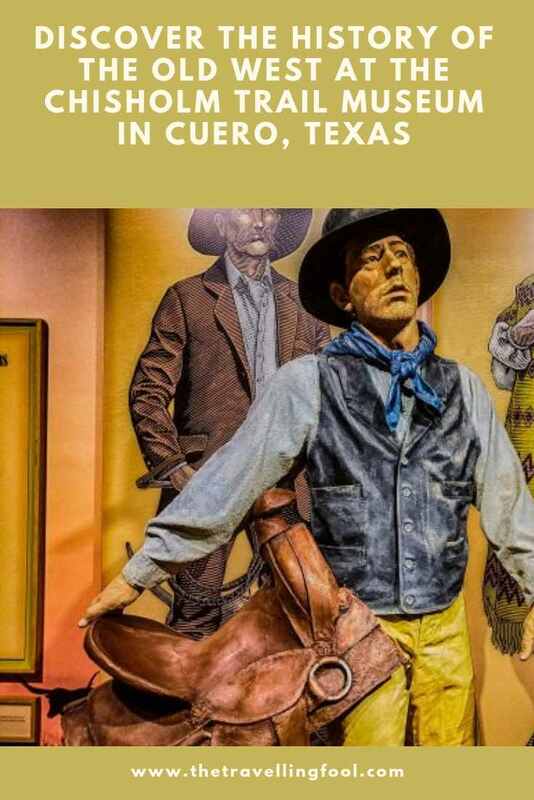 Located in South Texas, the town of Cuero got its start as a stopping point on the Chisholm Trail, a trail that was used for driving cattle from Texas to Kansas. 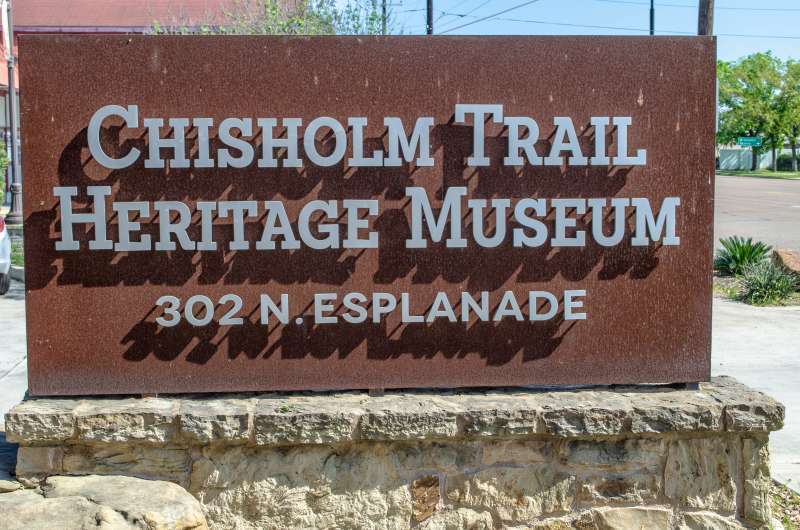 Today the town is the home of the Chisholm Trail Museum. And just so you don’t get laughed at, the way you pronounce Cuero is “Kwair-oh”, meaning hide or leather in Spanish. You can learn a lot from museums about the old west, or those dedicated to how people used to live, and this one is no different. The Chisholm Trail Museum in Cuero not only showcases the history of the old cattle drives but also the history of the old west in South Texas. Just like the old west itself, the name Chisholm Trail has been the subject of dispute. Many historians say the Chisholm Trail didn’t start until you crossed the Red River into Oklahoma Indian Territory. Cattle trails in Texas were called the Eastern Trail and the Goodnight – Loving Trail. The Chisholm Trail was named after fur trader Jesse Chisholm, who though he never drove any cattle on any trail, scouted and blazed a trail to ship his furs to various trading posts. 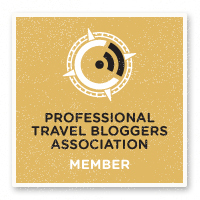 But as time went on others started calling the southern trails that started in Texas the Chisholm Trail if they later intersected and joined up together. The cattle drive trails in Texas were established after the end of the civil war. With an abundance of Cattle in South Texas and the need for beef in Northern States, entrepreneurial ranchers decided to drive cattle north to railyards where the beef could be shipped East. In 1866 Cuero businessman Crocket Cardwell hired trail boss Thornton Chisholm, unknown relation to Jesse, and 30 cowboys to drive 1800 head of cattle from Dewitt County to St Joseph Missouri. The trip took seven months and during that time the men endured harsh weather conditions, Indian attacks and were generally unwanted guests by the people and townsfolk that lived near the trails. During the years 1866 through 1884 an estimated 6 million head of cattle were driven from Texas to the Northern stockyards. The Chisholm Trail Museum in Cuero is housed in the former Knights of Pythias Hall. The building itself is of historic importance. Built in 1903 the hall was restored in 2001 and now holds the Museum downstairs along with meeting rooms upstairs. 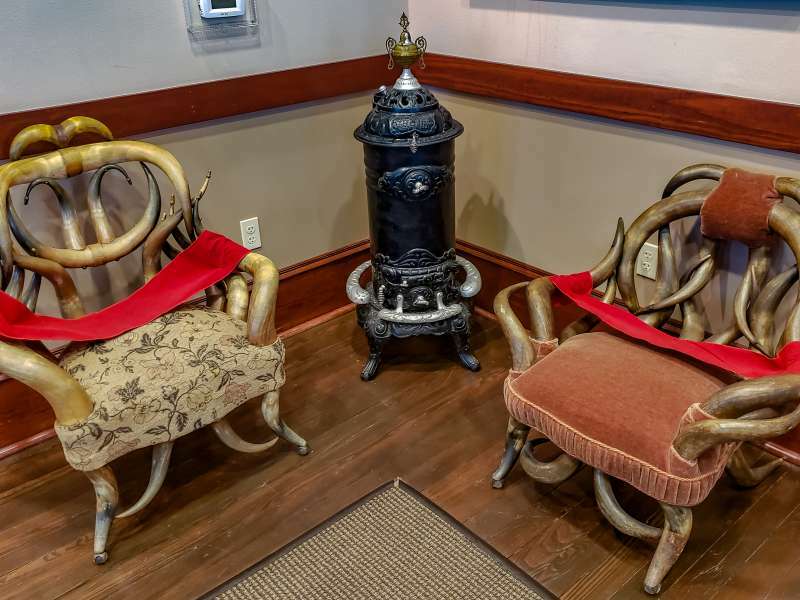 Artifacts from the Knights of Pythias are on display and the building has been restored to look the way it was when originally built. Once inside the museum you are greeted with artifacts from the old west and what Cuero and the surrounding area was like in the 1800’s. There are maps showing the old Cattle trails and telling the stories of the ranchers, cowboys and families that made this part of Texas home. 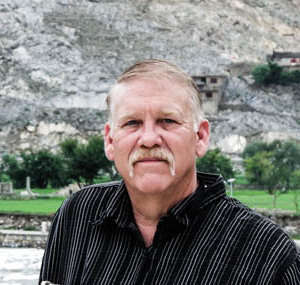 One of the stories you will discover is that of the Sutton-Taylor feud. While West Virginia and Kentucky had the famous Hatfield and McCoy feud, Texas had the Sutton-Taylor feud. 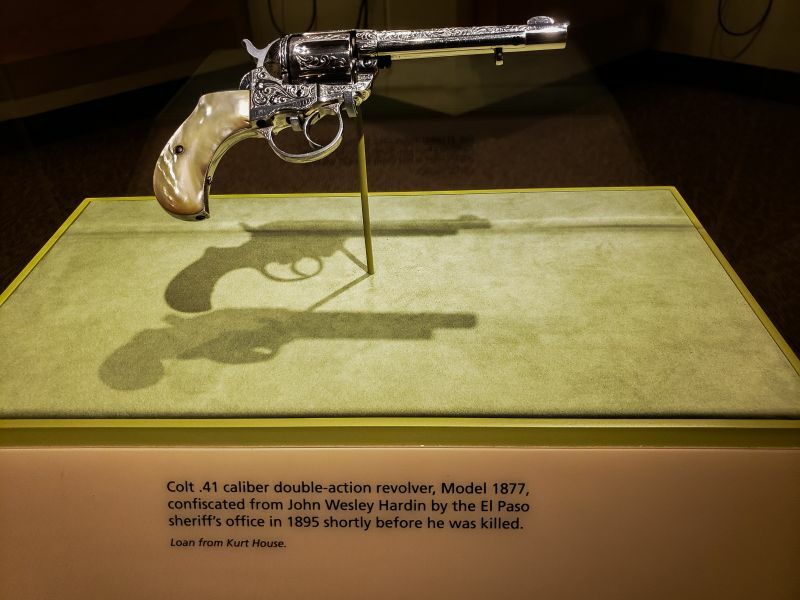 Starting in 1868 and lasting 8 years the feud claimed at least 35 lives and involved Deputy Sheriffs, family members of Texas Rangers, cattle rustling and even infamous Texas gunman John Wesley Hardin was involved at one point. John Wesley Hardin had relatives in the area and killed both the Deputy Sheriff and the Sheriff of Dewitt County in different gunfights on the same day. After escaping jail Hardin went on to even more notoriety before being killed in El Paso Texas where he is buried today in the Concordia Cemetery. The feud was the bloodiest in Texas history and finally came to a close when the Texas Rangers rode into town in force and put a stop to the hostilities. The Chisholm Trail Museum houses memorabilia from the old west including saddles, clothing and weapons. There is a short film shown in the theater and while the museum is not huge or take hours to tour, it does a really good job of telling the story of what is was like in the 1880’s in Texas. There is also a replica Chuck Wagon on display. 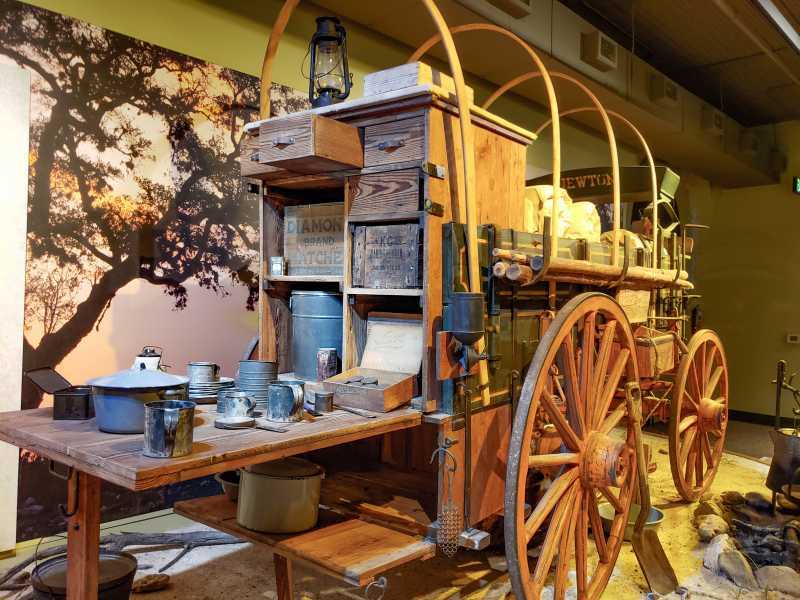 The chuck wagon was the original food truck, along with portable office, medical clinic and everything else needed along the trail. Toolboxes, lanterns, water barrels, canned foods, salt, bacon, flour, extra firearms, medicine and more was packed tightly into the wagon. 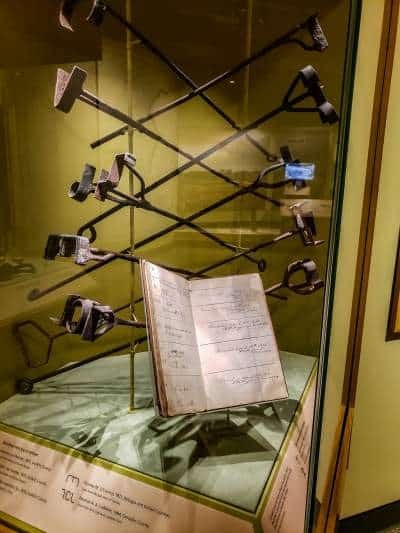 The Museum traces the history of ranching families in the Guadalupe Valley and the men that risked everything to drive cattle to the stockyards in Missouri and Kansas. There is also the Tinker Collection of over 900 objects and artifacts from the US, Mexico and South America. Dr. Edward Larocque Tinker amassed a huge collection of clothing, personal items, saddles, spurs and other ranch and horse related gear. 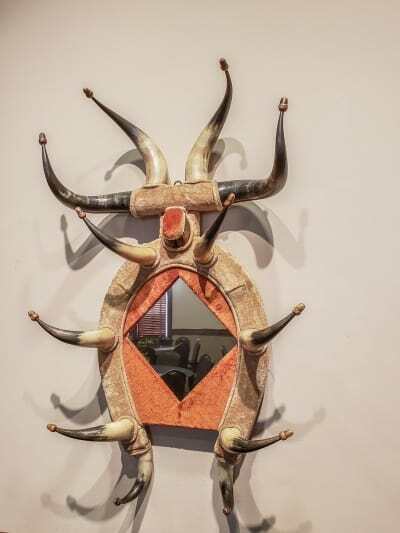 In the 1950’s the collection was donated to the University of Texas and is on permanent loan to the Chisholm Trail Heritage Museum. It is always interesting to look back at history and see how people lived. 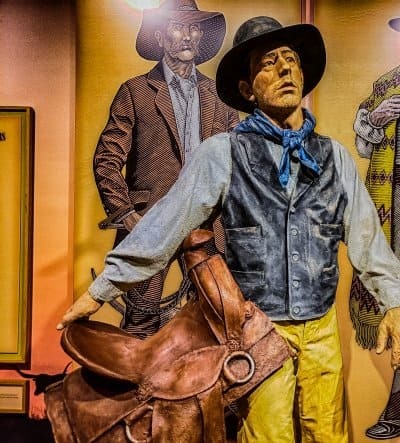 To learn bout what makes places and the people that lived there special is what travel is all about and The Chisholm Trail Heritage Museum in Cuero is a great place for anyone who has an interest in the Texas history, the old west or cowboys.